Hiking makes you more creative! September already? Say it isn’t so! I hope your summer hiking season (for those of us in the Northern hemisphere) was filled with great trails and superb weather. However, as a realist, I’m imagining a few things that might have gone wrong with gear, food, or navigation. I certainly had my share of snafus this summer. Hopefully, yours didn't require first aid!! This month’s newsletter will introduce you to a first aid device that is very ingenious, and just might save someone’s life. You’ll also take a peek at a study of adult hikers that found a boost in creativity after being out in the “wilds” for 4 days. I always come back from my multi-day adventures with more mental juice. I’d love to hear your experiences, too. Contact me and I will add it to my “best hiking tips” section. Send me your message at the bottom of this page. If you’re already comfortable with the terms “anaphylaxis” and “epinephrine”, skip down to the bottom of this section. If you’re new to the idea that venom from snakes or insects could cause a lethal overreaction of the body and lead to respiratory arrest, you might want to continue reading. Overreactions are called “hypersensitivities”. They’re generally not much fun. Hypersensitivities happen in four different ways in the human body, creatively named Types 1 through 4. (More on how to boost creativity in a moment). Today we'll concentrate on Type 1. Type 1 Hypersensitivity, or an allergic reaction, can leave you with some itchy red bumps (urticaria, or hives), for instance. Or it can become an intense, life threatening reaction called anaphylaxis: airway closure, a big drop in blood pressure, possible loss of consciousness (or worse). In order to reverse anaphylaxis & save someone’s life, epinephrine is the drug of choice. For hikers, it comes in a portable, easily injectable form called an “epi pen”. Whoa! Hold it right there. But here’s where life gets a whole lot better: a talking “autoinjector”. This device tells you what to do, and how to do it! No anxiety about how to do it "right" in the heat of the moment! So if you hike with someone who already knows that epinephrine is going to be required if a bee sting occurs, you might want to talk about this device with her/him. Note: I don't make a dime from this recommendation. However, I've seen anaphylaxis and I want to prevent it in my virtual trail buddies. Scientists are not known for their wildly creative naming abilities (see above example). Let me bottom line it for you: 56 adult hikers participating in Outward Bound backpacking programs of 4-6 days duration and without access to electronic devices (completely unplugged!!) were given a test after their outdoor experience to measure their creative thinking and problem solving abilities (the details of the test, called RAT, are given in the paper). A 50% increase in performance after 4 days of backpacking (or “exposure to nature”, as the authors put it). This clears up a little mystery in my own mind: whenever I come back from sleeping on the ground surrounded by rocks & trees, I am able to jump right on my mental tasks and come up with creative solutions to problems. Now I know I’m not just imagining it! The references are fascinating, too. So please hop on over and take a look. It’s an open access, free article. And it just might get your creative juices flowing! If encouraged it will nuzzle your open hand. 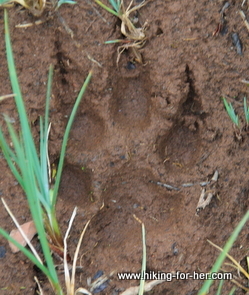 Before I say good-bye, feast your eyes on this photo of a very large, really fresh wolf track. My husband took that photo during a multi-week trek in some very wild territory a few summers ago. The photo reminds me to feed my craving for wilderness. My wish for you is a chance very soon to touch the wild, dreaming beast that makes you crave time on a hiking trail. As always, feel free to share your comments and suggestions, I love reading my mail.